Everyone knows that Popeye got his strength from spinach, but a team of researchers at Vanderbilt University believe we harness certain properties from spinach in order to generate electricity. The team has developed a technique to combine the photosynthetic protein that converts light into electrochemical energy in spinach with silicon, the material used in solar cells in order to create “biohybrid” solar cells. The team, whose research was published online on Sep. 4 in the journal Advanced Materials, was led by David Cliffel, associate professor of chemistry and Kane Jennings, professor of chemical and biomolecular engineering. “This combination produces current levels almost 1,000 times higher than we were able to achieve by depositing the protein on various types of metals. It also produces a modest increase in voltage,” Cliffel noted. The team has announced that their next step is to build a fully functional PS1-silicon solar cell. Jennings believes that a two-foot panel would be capable of putting out at least 100 milliamps at one volt. While that’s not enough to power a house, it would be enough to charge a number of small electrical gadgets. But why spinach? For one thing, the green vegetable contains a certain protein used in photosynthesis that continues to function even when it is extracted. Known as PS1, this protein was discovered to convert sunlight into electrical energy with nearly 100% efficiency, compared to conversion efficiencies of less than 40% achieved by man-made devices. 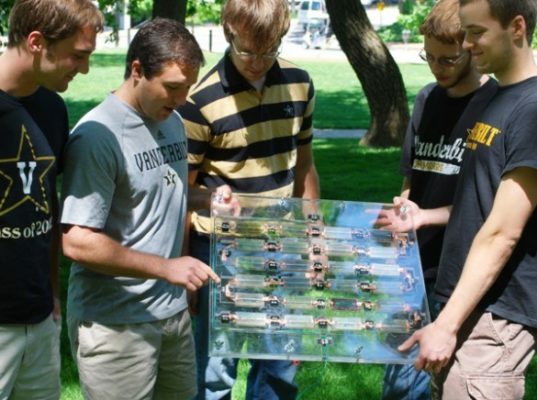 This prompted various research groups around the world to begin trying to use PS1 to create more efficient solar cells. It’s also cheaper to grow spinach than to use finite resources like platinum and indium!